(Macao, Feb. 3, 2017) – One of the most popular entertainer and DJ duos from Commercial Radio 2(Hong Kong), Jim Yan and Donald Tong, will bring their hit show Yo! St. ILUB battle Ng Hang Him Cosmos Tour Macao to The Venetian® Macao’s The Venetian Theatre on Mar. 4, 2017. Tickets will be available from Monday, Feb. 6, 2017, at all Cotai Ticketing box offices, as well as through Hong Kong Ticketing and Kong Seng Ticketing. In addition to their success as radio show hosts, both Jim and Donald are versatile performers across a wide range of entertainment fields, including as singers, actors and presenters. I Love You Boyz, the boy group formed by Jim and Donald, is renowned for its humorous, exaggerated style and slapstick comedy. 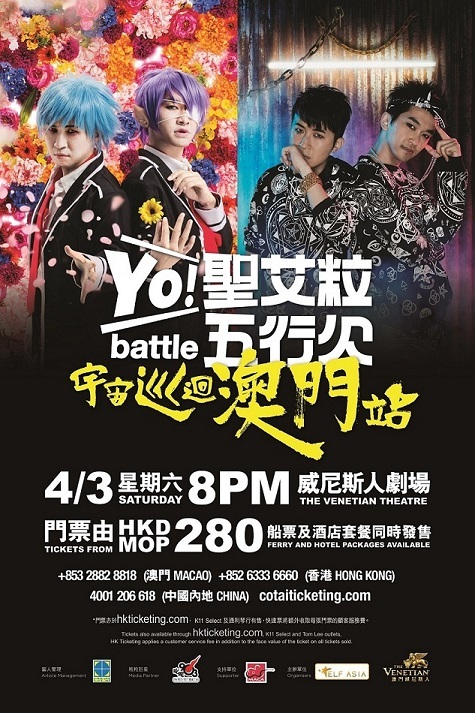 Popular among audiences of all ages, the duo has particularly struck a chord with younger Hong Kong listeners through their teen-targeted talk shows, dramas and live performances, especially the recent ‘Yo! St. ILUB battle Ng Hang Him Cosmos Tour Hong Kong’, which sold out as soon as tickets went on sale. The show received a standing ovation and glowing reviews across the media. Audiences for the Macao show can expect a similarly high energy, full-on and interactive experience, featuring all of Jim and Donald’s most popular sketches, characters and improvisations. This will include an on-stage hip-hop battle between them, with the audience voting for the winner.